THE family thought their secret was safe and buried . . . But now it’s all in the open! This is after the KaNyamazane Magistrates Court ordered the body of 17-year-old Lungile Nkosi to be dug up on Wednesday. Lungile was allegedly beaten to death by his parents and his two siblings for stealing a cellphone. Concerned members of the community brought the matter to the attention of the police and an investigation was launched. Mpumalanga police spokesman, Brigadier Leonard Hlathi said the family didn’t report the matter to police but informed an undertaker and had the death registered as a natural death. Lungile was then buried on Saturday. “The suspects were arrested, and charged with murder and defeating the ends of justice,” said Hlathi. 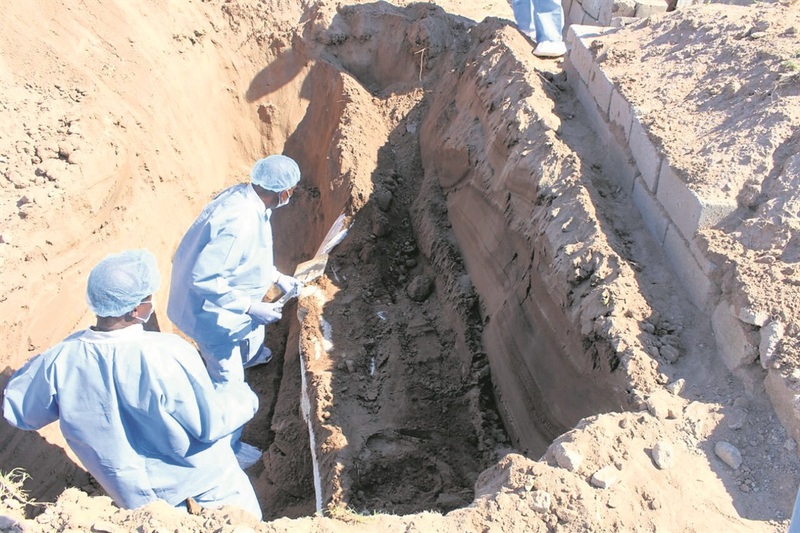 He said police were still busy with investigations following the exhumation. They are getting further statements. Lungile was allegedly burnt with hot water and beaten with a hoe and shovels. He was also apparently electrocuted in the process. Community members told Daily Sun that his body had been kept in the house and was only taken to the mortuary the following day. Ouma Mokoena (41), a resident said the family was a disgrace to the community. “We are shocked. The family should have taken the matter to the police instead of taking the law into their own hands. “We are angry and want them to pay for what they did,” she said. Lungile’s friend, Phumlani Fakude (18) said his friend’s death was painful. The four family members made their first court appearance at KaNyamazane Magistrates Court and were kept in custody. They are expected to appear in the KaBokweni Magistrates Court today.